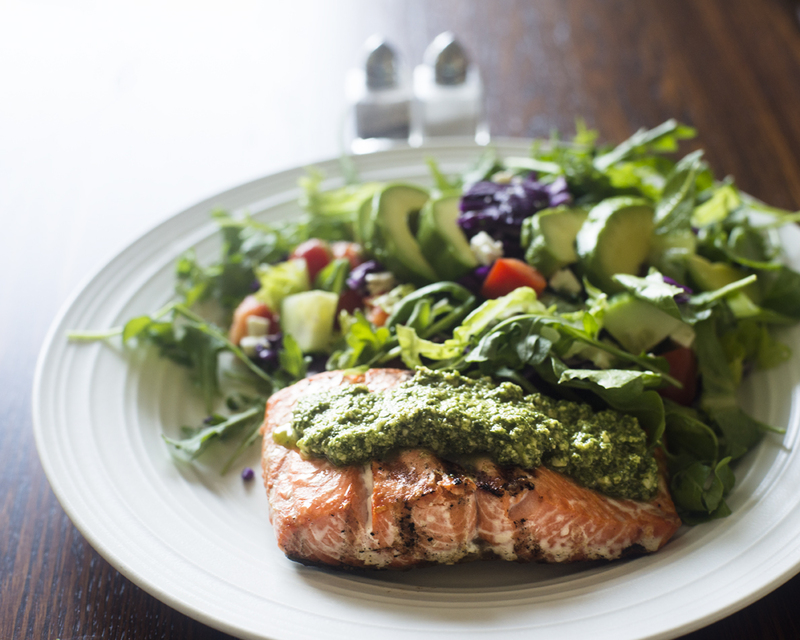 Wild caught salmon topped with arugula pesto along with salad. The other day we bought a huge container of arugula (known as rocket in the U.K.) and started eating it in salads. In the summer I crave fresh salads, don’t you? We like to vary our greens so as not to become bored with the same old, same old. And at 10 calories per two cups with tons of antioxidants and vitamins, it is really a healthy superfood. Believe it or not, it’s from the same family as broccoli and kale. But no matter how much arugula we ate, it didn’t seem to be making a dent in the amount we had. I hate to waste food — a quality that I now realize I inherited from my paternal grandfather — so I thought I had best figure out a creative way to use it up before it went all slimy. So it was that I happened on a recipe for arugula pesto. Since I adore the flavours and texture of basil pesto and I also love to experiment with new recipes, I tried it. It has become a new favourite. It’s spicy, flavourful, healthy and versatile. So what’s not to like? We’ve been eating a lot of fish lately and this pesto adds a piquancy that works well with many different types. We’ve eaten it with grilled haddock and salmon, as you can see above. Great with both. 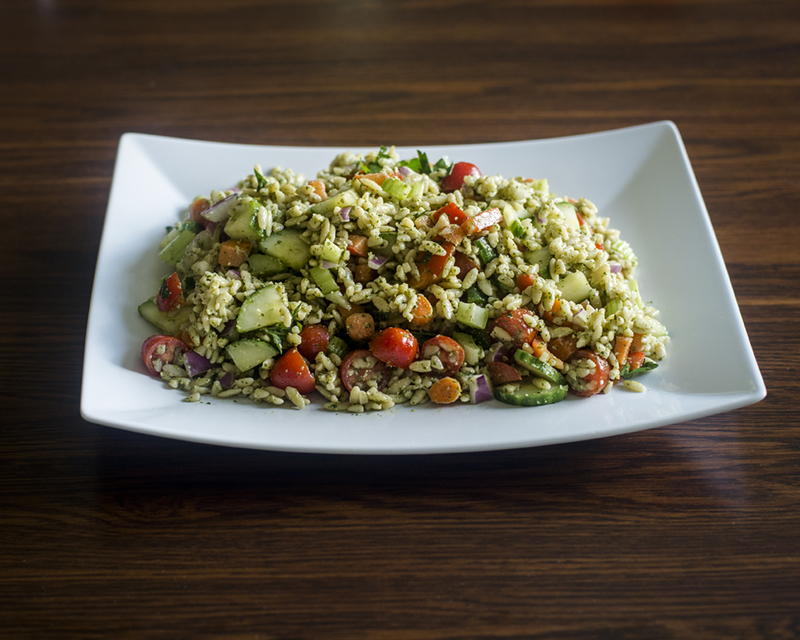 I still had some pesto left after those meals so I decided to try adding it to a veggie orzo salad, since I often do that with basil pesto. Another winner. I’ve read that it makes a great sandwich spread when combined with mayo. Must try that soon. So if you like foods rich in ingredients found in the Mediterranean diet, this might appeal. It’s easy to whip up and even easier to enjoy. Here are two different recipes that I used to make mine if you want to give it a try. It all looks so delicious, Sherry. Perfect for a hot summer night..and we are in the middle of a heatwave right now. great idea! And your food photography is absolutely delicious! For the gorgonzola version, I recommend using toasted walnuts, Yum! I really love pesto, and this sounds wonderful, Sherry. I will definitely be making this real soon. Yummy post, Sherry. 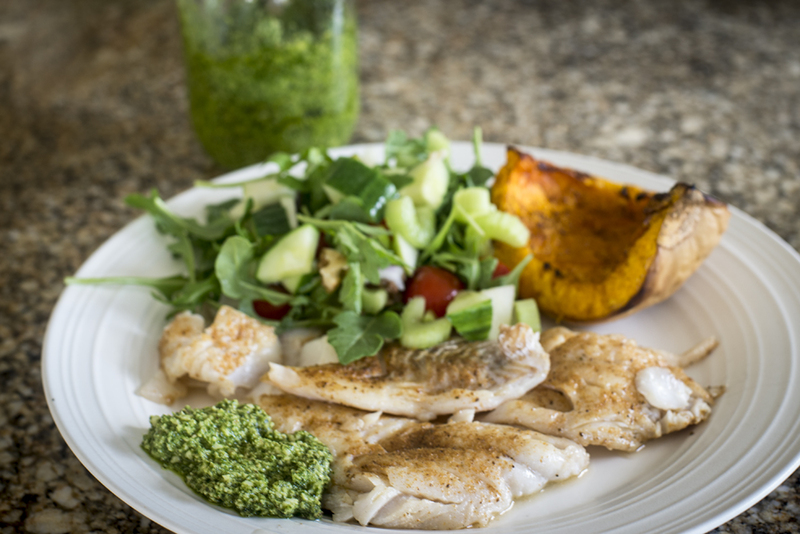 I love pesto…your salad and fish look delish. I can never get enough salmon either, Barbara. Thanks for stopping by! Wow, Laurie, you have just given me a trove of new ideas to try. Adding garbanzos is a brilliant idea. And a gorgonzola version, yum. I think I will grow my own arugula next year since it is pretty easy. We are growing Swiss Chard this year so I will take a page from your book and get to making some Swiss Chard pesto as well. Thanks for inspiring me! Great food photos! And I’m with you on the waste issue – I’m exactly the same, can’t stand throwing any good food out! Arugula pesto is also good on pizza, or mixed with ricotta and folded into pasta (or just straight on pasta too, if you prefer a stronger taste). We grow arugula – super easy, quick, prolific and it often self-sows easily so we usually have some volunteers as well. Grows well in our shoulder seasons too. These days I’m doing two arugula pesto variants: one with toasted walnuts, a bit of lemon juice and gorgonzola cheese (yummy, but very rich); the other with garbanzos, nuts (almonds or walnuts or combo), and parmesan, and less oil as the garbanzos give it a creamy texture without so much oil or cheese. Both delicious, and they freeze well. This is pesto-making (and freezing) season for us – today I must get to the Swiss chard, which also makes great pesto.